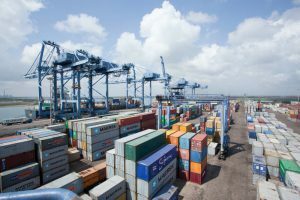 According to a report by credit-rating firm ICRA, Cargo traffic growth at Indian ports will remain sluggish in the near term on account of uncertainty associated with some of the cargo categories, including coal and container. There is uncertainty in imported coal due to ramp up in domestic coal production and persisting delays in execution of Greenfield power projects. Container movement will be affected due to the relatively weak global environment and exim trade. In the first half of 2015-16, total cargo handled at Indian ports registered a 20% increase to 516 million tonnes (MT) over first half of 2014-15. The growth was pegged down by de-growth in volumes by 1% at non-major ports (under the control of State governments), which had registered a 13% y-o-y growth in volumes, to 471 MT in financial year 2015. The weak performance was on account of 18% drop in iron ore volumes; 11% drop in other cargo and an 8% drop in coal volumes. Major ports (governed by the Central government), on the other hand, registered a relatively better performance in the first half of 2015-16, supported by a growth of 12%, 3% and 11% in coal, POL and other cargo volumes, respectively, even as iron ore volumes dropped by 48% y-o-y. ICRA research said that during 11 months in financial year 2015-16, the major ports reported a 4.2% growth in the overall throughput over the corresponding period in the previous year. The growth was K Ravichandran, Senior vice-president and Co-Head, Corporate Ratings, ICRA, said in the report that iron ore volumes have been affected as mining restrictions prevailed during a large part of the year in major states such as Karnataka, Goa and Odisha; other policy measures such as high export duty, which was reduced to nil in the Budget 2016-17, on low grade iron ore; and prevailing slump in international demand and prices. The decline in coal volume growth in the last few months has been on account of increase in the domestic production and subdued demand on account of the slowdown in energy demand and delays in commissioning of new power plants due to several issues bedeviling the domestic power sector. As non-major ports had higher share of coal cargo, their volumes were relatively more impacted during the first half of 2015-16. Over the medium to long term, the outlook for cargo growth continues to be strong, driven by domestic requirements of coal for power (including coastal movements) and other sectors; crude oil, for meeting domestic petroleum requirements; and containers, given the cost and logistical advantages associated with containerisation, Ravichandran said.